AngularJS – Part 8, More choice when testing</ul> Sometimes we need some data that is globally available but at the same time we do not want to pollute the global (window) namespace with the definition for this data. Angular provides us the value and constant services which can do exactly this. Values and constants declared in this way can be injected into any controller or service like any other dependency (e.g. $scope, $http, etc.). In our application we frequently need access to different properties of the currently logged in user. This could be things like the full name of the user, it’s role and so on. Typically we would load this data after the user has successfully logged into the system and keep this data around as long as the user remains logged in. 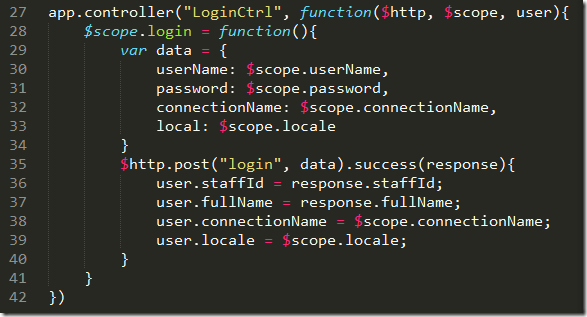 Angular interferes which service to inject by looking at the name of the parameter. Thus our function parameter has to be named the same way as the registered value. We will discuss dependency injection (DI) and how it is realized in Angular in a future post. As mentioned above, we can also e.g. register an object as value service. The above code is assuming that the user entered a user name and a password, selected the local and the connection (in our application a user can connect to different sites which we distinguish via unique connection names). The user then clicks on a login button which triggers the execution of the above login function. The data the user has entered is posted to the backend and assuming the user can be authenticated the server will respond with a success status and send back the user data. even if the layout of the response matches the user value object exactly. We have to do a mapping property by property, i.e. The difference between a value and a constant service is that the former can only be injected (and thus be used) in a service or a controller while the latter can also be injected into a module configuration function.. (I will discuss the module configuration function in a future post). Angular value and constant services are an ideal way to provide application wide access to shared data without having to pollute the global namespace. They can be injected similar to any other service into our controllers and services. The only real difference between a value and a constant is that the latter can be injected into a module configuration function while the former cannot.